Scottsdale, Arizona – Do you have a shelf full of “He likes golf so I’ll buy him this” golf gadgets collecting dust in the garage? Well, just forward this hint along to your well-meaning loved ones before they start their Father’s Day shopping, or leave an innocent, printed copy in plain view around the house somewhere and you won’t have to visit that corner of the garage this year. 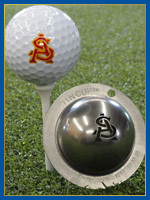 Tin Cup Products, LLC emblems are a fun and easy way to comply with the USGA Rules of Golf to mark your ball for identification, and add your own personal style to your golf ball at the same time. These are the same emblems used by many professional PGA, Champions, European and LPGA Tour players to make certain their ball is clearly marked. Named “Best New Product” at the 2010 PGA Merchandise Show, the Tin Cup personalization process takes just seconds, as players simply place the stainless steel Tin Cup stencil over a ball and trace the emblem using an ultra fine point permanent Sharpie. Arizona dads will be happy to know that both the University of Arizona “Block A” and the Arizona State University “Pitchfork” and ASU logo are both prominently featured in Tin Cup’s popular collection of 30 officially-licensed college cups. Whether you’re supporting the U.S. Military, want to promote your alma mater or your certain fondness for cigars, you’ll find the Tin Cup logo stencil that’s just right for you. In addition to more than 90 existing models, Tin Cup introduces new logos and designs each month, producing an ever-expanding collection to choose from, including all four major military branches. Other popular emblems we’ve seen about are the Luck of the Irish and the Jolly Roger. And don’t forget game improvement markings for your ball. 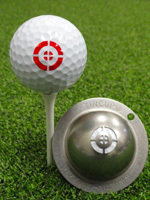 The Take Aim Tin Cup emblem features a modified bulls-eye pattern with lines to help you aim and then set-up to your target and intended path of play; it’s in their popular “Visualization Series”. 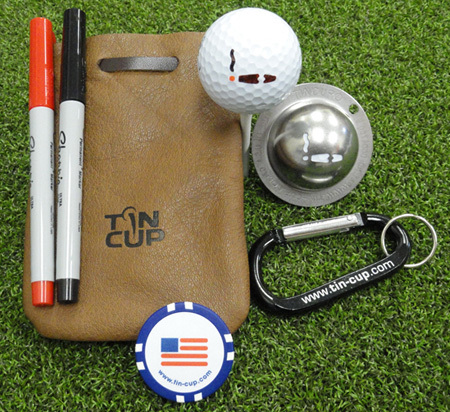 Tin Cup products are made in the USA from 100% stainless steel. Each design sells for $19.95 and Tin Cup also offers a kit including the design stencil, storage bag and pens for $30. If you wish to use your own logo design, Tin Cup’s customization program provides low minimums, affordable pricing and prompt delivery for corporations, charities, media outlets, celebrities, events and others seeking a distinctive gift. Tin Cup stencils are currently sold at more than 750 retail locations worldwide, including PGA Superstore, Edwin Watts, Roger Dunn and Golfsmith, as well as elite clubs and resorts like The Boulders, Baltusrol, Bandon Dunes, Congressional, Kingsmill, Medinah, Reynolds Plantation, Torrey Pines, Wailea and Sea Island. The company also has distributors in Canada, the UK and Japan. 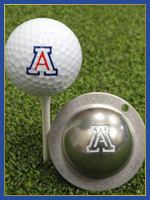 For more information, visit www.tin-cup.com or call 888.984.6287.